Michael Manteit wears the Collingwood polo on his first visit to the Westpac Centre. Photo: Collingwood Media. Seven of the 22 players who formed a part of Collingwood’s premiership team of 2010 started out on an AFL rookie list. That stat is enough to give any new rookie a glimmer of hope when they walk in the doors of the Westpac Centre for the first time. 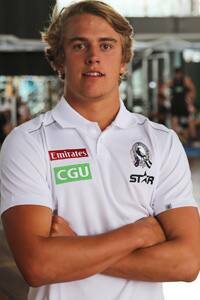 Just ask Michael Manteit, the 18-year-old Sandringham Dragon who became a Magpie with the eighth overall selection in Wednesday’s Rookie Draft. “Collingwood is an outstanding club to go to,” Manteit told collingwoodfc.com.au. Known for his ability to read the play at half back, Manteit averaged 20.1 disposals and 4.2 rebounds across his 14 TAC Cup games in 2014. He represented Vic Metro at the National Under 18 Championships and was high up in Collingwood’s thinking heading into the National Draft, according to General Manager of List Management Derek Hine. “Michael’s a player who has played mostly at half back and through the midfield as well,” Hine explained. “He’s a nice user of the ball and he’s had a really consistent TAC Cup season. HIGHLIGHTS: Manteit's TAC Cup season. Originally hailing from Phillip Island, Manteit studied at Melbourne High, graduating in 2013. A natural sportsman, Manteit spent 2014 working part-time and studying a double degree in business and sport and recreation management at Victoria Uni. Naturally disappointed to be overlooked in the National Draft, Manteit spent the last week back home with friends in an attempt to keep his mind occupied. “I went down to my mate Tim’s house and went surfing and spearfishing and just got my mind away from footy,” he said. “I’m still trying to keep fit so I was going running down at Phillip Island. “I came back up on Tuesday night and was back in today, so I just tried to get away as much as possible and get away from the footy environment. VIDEO: Inside the War Room at the Rookie Draft. Within two hours of having his name read out during the Rookie Draft, Manteit found himself at the Westpac Centre with a new number (No. 39) and a locker that already bore his name. “As a footballer, I think that I’m a competitor,” he says of the attributes he hopes to add to the Black and White mix. “I can be a good leader and I’ve got a good endurance base for running. “I think I’ve got a really good on and off field character. I can have a laugh and get serious, so I’m just a good competitor, I think that’s the main thing in terms of my footy characteristics. Which people have helped you on your football journey?